Ever since DC Entertainment made a concerted effort to market to young kids especially girls with DC Super Hero Girls it's been a huge hit. They've created everything from toys to books to home DVDs. 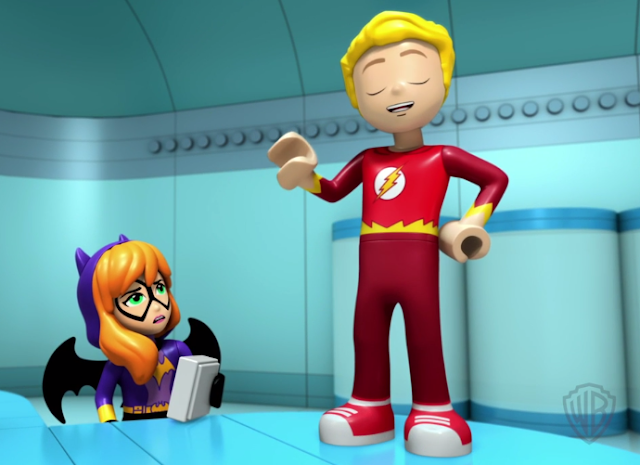 Now, they've joined the LEGO animated universe with LEGO DC Super Hero Girls: Brain Drain. Missing memories provide an intriguing mystery for everyone’s favorite young female protagonists in the all-new animated film, LEGO® DC Super Hero Girls: Brain Drain. When Supergirl, Wonder Woman, Batgirl, Bumblebee, and Katana suddenly realize they cannot remember a single moment from their Monday at Super Hero High, the young DC Super Heroes spring into sleuthing action! Suspecting foul-play, they band together to retrace their steps and uncover the mystery of who exactly stole their memories – and what nefarious plan might be afoot? The voices you know from DC Super Hero Girls videos return with Grey Griffin (Wonder Woman), Tara Strong (Harley Quinn/Poison Ivy), Anais Fairweather (Supergirl), Teala Dunn (Bumblebee) and Stephanie Sheh (Katana), with Ashlyn Selich joining the group (as Batgirl). The cast also includes Yvette Nicole Brown (Amanda Waller), Greg Cipes (Beast Boy), Romi Dames (Lena Luthor), John DiMaggio (Gorilla Grodd, Wildcat), Jennifer Hale (Mad Harriet), Josh Keaton (Flash), Tom Kenny (Gordon), Rachael MacFarlane (Artemiz), Mona Marshall (Eclipso), Khary Payton (Cyborg) and Meredith Salenger (Lashina). LEGO DC Super Hero Girls: Brain Drain is scheduled for release on July 25 on Digital HD, and Aug. 8 on DVD. It’s directed by Todd Grimes, with a script by Jeremy Adams and Rick Morales as producer, and DC animation veterans Sam Register, Jill Wilfert and Robert Fewkes on board as executive producers.